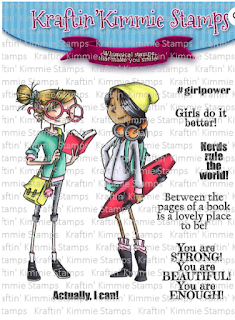 Kraftin' Kimmie Stamps set called "Girl Power". 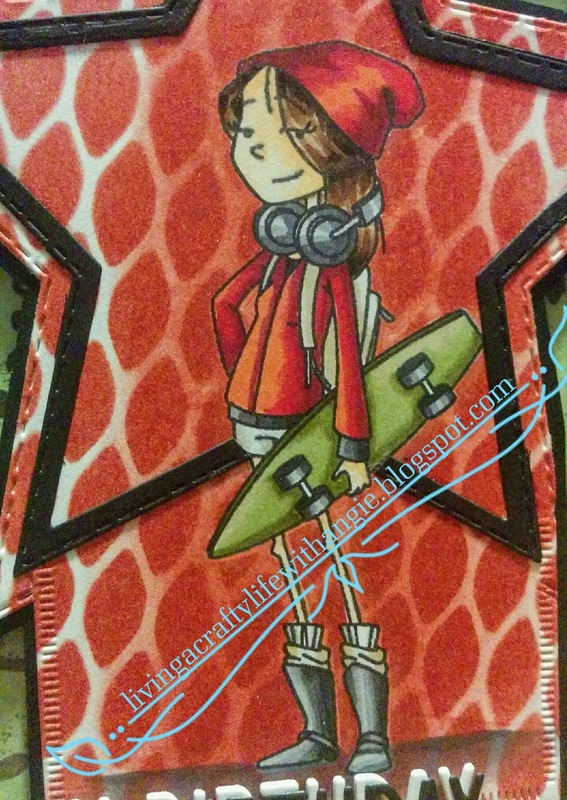 To create this fun card I first stamped the image on white 110lb cover stock paper. After I had colored in the image - see Copic color guide below - I stamped the same image on Inkadinkado Stamping Mask Paper cut out the girl as closely as possible. It's okay to leave a little extra for the legs since they are very narrow and it is difficult to cut out. 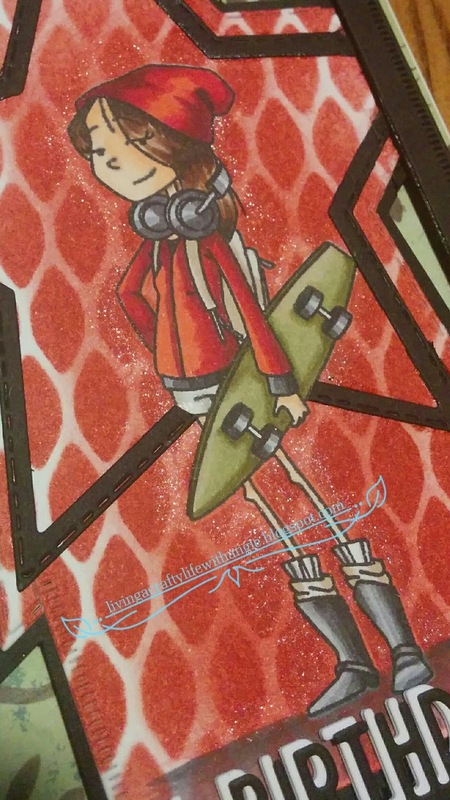 After covering my colored image with the Inkadinkado Stamping Mask Paper I used a Tim Holtz stencil called "Mesh THS041" and stamped using the Fired Brick - Red Distress ink pad. I then removed the stencil and lightly stamped around the image to soften the sharpness and cover some of the white. I then removed the Inkadinkado Masking paper. To create the star cutout I first created a black star outline using 2 medium star nesting dies. 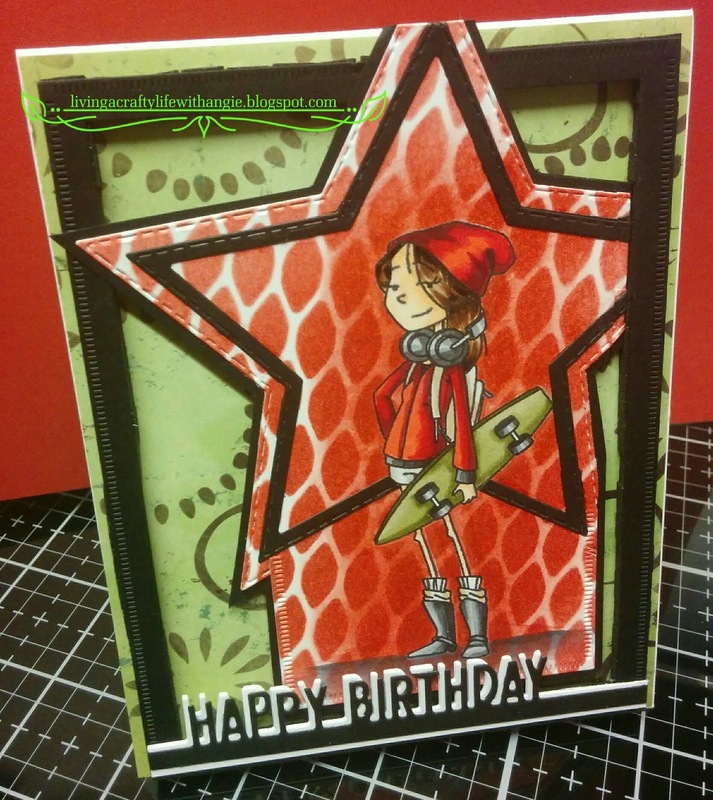 I used a larger star die set to cut the background for the image. In order to not cut the entire image and black outline piece I used only a portion of the cutting plates on my BigShot die cutting machine. By over hanging the image in between the sandwich it will only cut where there is pressure on the die. I suggest taping the die to the paper so it won't move using a piece of your least favorite washi tape, since it can easily be removed without damaging the image. I created a black border by using rectangle dies. I layered a "Happy Birthday" die slightly askew to create a white shadow effect. I used foam tape to add dimension to the black border and the star/image piece. Although difficult to see in the photos I finished up the card by using Clear Wink of Stella to outline the image in glimmering sparkle. I took as best a photo as I could as reference.